Rose gardening has special mystique of its own. Few perennials or flowering shrubs give you so many wonderful blooms soon after planting or have as long a period of bloom. Gardeners the world over are smitten by the allure of roses, but many people think of roses as elegant, but demanding prima donnas. Well, yes, if you start with strong, disease-resistant rose bushes. Full sun – At least six hours of good strong sunlight daily – less sun and you get fewer flowers. Good soil – Well drained, but able to hold moisture, and enriched with manure and/or compost. Roses are heavy feeders that thrive in rich soil. Timely care – Plenty of water and fertilizer and proper pruning at the right time. Be sure to stay on the lookout so you can nip any rose problems in the bud before they get out of hand. 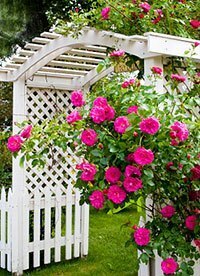 When to plant roses: New roses establish more quickly in the cool moist conditions of spring or fall, so plant soon as soil becomes workable in spring, or in fall. Roses are available bare-root or container grown. Watering: Always water regularly until established (for the first two months after planting). Keep roots moist before planting. It’s a good idea to soak them in a pail of barely lukewarm water for an hour or so before planting. Dig hole large enough for roots to spread. Place so that bud union (a swollen area between the root and canes) is at least 2 inches below soil line in warmer zones, 4 to 6 inches deep in Zones 2 to 4. Back-fill planting hole with soil into which you’ve mixed some peat moss and manure to three quarters full. Firm soil around roots, water well and let drain. Finish filling the planting hole, adding soil to form a mound over canes (in fall, this provides winter protection, in early spring, protection from sunscald). Remove mounds when roses begin to leaf out. Dig hole large enough to allow roots to spread. Remove the pot carefully to minimize root disturbance. Place plant at correct depth – to where the soil level was in the container – then back-fill part way and finish as above. David Austin’s English roses are the result of breeding to combine the forms and fragrance of old roses with the repeat flowering of modern roses. Find out more about David Austin’s English roses.